This cable with 1/4 in. phone plug is terminated for use with the UniPak transmitter. 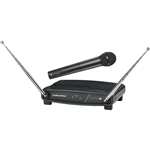 The Audio Technica ATW-T1001 System 10 Wireless Body Pack is designed for use with the System 10 wireless system. Audio-Technica's System 10 is a digital high-fidelity wireless system designed to provide performing musicians and presenters with advanced 24-bit operation, easy setup and clear, natural sound quality. Operating in the 2.4 GHz range, far from TV and DTV interference, System 10 offers extremely easy operation and instantaneous channel selection. Up to eight channels may be used together without any frequency coordination problems or group selection issues. System 10 receivers and transmitters offer an easy-to-read digital ID display. Audio-Technica's System 10 Stompbox digital high-fidelity guitar wireless system combines the advanced 24-bit operation, easy setup and clear, natural sound quality of other System 10 configurations with unique functionality for guitarists, bassists and other instrumentalists. Operating in the 2.4 GHz range, far from TV and DTV interference, System 10 Stompbox offers a rugged, metal, pedal board-mountable receiver with foot switch, two switched TRS balanced 1/4" outputs and an output mode selector. With the tap of a foot, musicians can toggle between outputs (e.g., for switching amps) or mute and unmute one output without muting the other (e.g., for convenient tuning). And a single receiver can be paired with up to eight UniPak(R) body-pack transmitters, allowing users to easily switch between instruments without having to move a body-pack from one instrument to the next.